A common feature in word processors is to define which style follows the application of any given style e.g. 'Heading 1' followed by 'Heading 2' itself followed by 'Body'. I've had a good look around the UI and this forum but cannot find anything. So please add as a suggestion or show me how to do it! PS: at present I'm copying past the first couple of lines of a given section and then replacing the text. Not ideal but it works. I'm being particularly hopeless here... I cannot find the 'Next Style' option anywhere! I try to explain in three steps and give you a screenshot. I assume you have an APub document open with some text in a text frame. By the way: I'm on Windows. Select menu 'View > Studio > Text Styles' and make sure it has a checkmark. 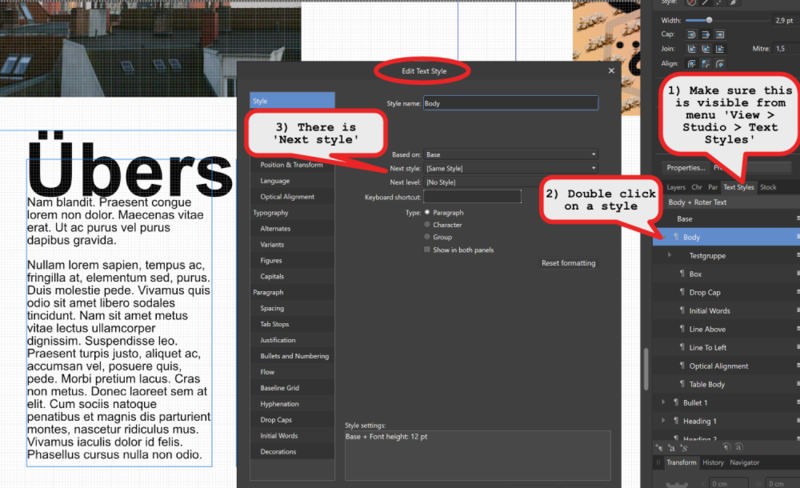 In the 'Text Styles' studio double click on any text style > a pop up window opens named 'Edit Text Style'.